In what was billed as one of the biggest games to be played inside the McCarthey Athletic Center, Gonzaga welcomed Arizona to campus on Saturday. And, well, if college basketball games were only 20 minutes, the Zags would have walked away with a big win. Instead, they lost 68-63, blowing a 10-point halftime lead. The problem was that the Zags, despite an enormous 33-point night from Kyle Wiltjer, floundered in the second half. Like, really, really floundered. At one point late there were three consecutive trips down the floor during which Gonzaga failed to get a shot off. Meanwhile, Arizona's Gabe York was playing a one-man game of horse from three-point land. Meanwhile, Gonzaga continued to turn the ball over (they had 16 on the day with five of those attributed to guard Josh Perkins, who struggled mightily on Saturday) and made just two of their final 15 shots, which is really not good when you're playing a team as packed with talent as Arizona. Domantas Sabonis finished the game with 18 points and 16 rebounds, taking care of the block while Przemek Karnowski missed his second-straight game with a back injury. Troublingly, Witljer and Sabonis combined for 51 of Gonzaga's points. No other Zag made a three pointer besides Wiltjer. The loss knocked Gonzaga down to No. 20 in the AP Poll. 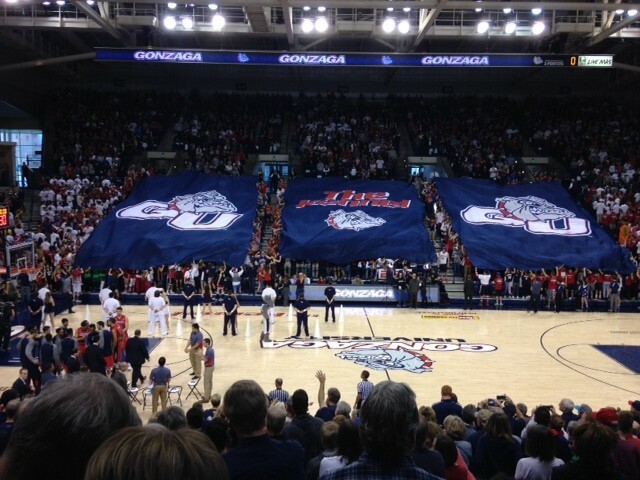 Gonzaga returns to action tomorrow night against Montana at the Kennel. Then, they've got UCLA, who just knocked off No. 1 Kentucky coming in on Saturday. So yeah, there's no time to relax for the Bulldogs. A week and change after their embarrassing Apple Cup showing, the Washington State Cougars finally found out where they're headed for the bowl season — El Paso. For the geographically averse, this is a town in Texas, but the far west part of Texas that dips halfway across the bottom of New Mexico and borders Old Mexico. This is more importantly the city that hosts the Sun Bowl on Dec. 26 at 11 am. They'll face the Miami Hurricanes, who showed a lot of promise during their 8-4 season in the tougher-than-usual ACC. As it turns out, the Cougars may have gotten some help from a familiar face to bring them to the Sun Bowl. Former WSU head coach Mike Price (who formerly coached UTEP) is on the Sun Bowl committee and likely had something to say about bringing the Cougars south for the holidays. "I'm so excited to have all the Cougar faithful down here. This is a great matchup," Price told the El Paso Times. Incidentally, the last time the Cougars were in the Sun Bowl, Price was still their coach. So a few weeks ago, when the Seahawks lost to Arizona and were looking at a 4-5 record, I said something like, "the Seahawks probably aren't going to make the playoffs." This is the dumbest thing I've ever written because it now looks like Seattle has a really damn good chance of a post season. That's because yesterday, they went to Minnesota and ripped the soul out of the collective body of the Vikings. In what was one of the most dominant performances in recent memory, the Seahawks strutted away with a 38-7 win during which their defense did not allow a score (those seven points were on a late-in-the-game kickoff return) and basically made alleged NFL great running back Adrian Peterson irrelevant. Peterson had just 18 yards. 18 yards. That's like the distance from your couch to the fridge (if you have a big house, but whatever). The Vikings offense, in total, managed just 125 yards for the entire game because the Seahawks defense returned to form and performed like a black hole into which running backs entered and mere smoke emerged. And their offense? Equally dominant. Russell Wilson threw for three touchdowns. Thomas Rockin' Rawls had another 100-yard-game. Doug Baldwin scored with ease. For the first time in a long time, a Seahawks game did not result in Northwest-wide hand wringing and heartburn as the Hawks ruled the game from the opening kickoff. And now, finally, it looks like Seattle's ship has arrived. They've won five of their last six games and would be in the playoffs if the season ended today. Speaking of dominance, the Gonzaga Prep Bullpups had their way with Skyline (winning 34-16) on Saturday night, winning their first state championship in 28 years. And they broke some records along the way, too.